The DEWALT Class 2 modacrylic FR t-shirts will help protect workers with a brand name they know and trust. The DEWALT FR t-shirts are madein the USA with global materials to provide Guaranteed Tough™ protection. Available in short or long sleeve, the jersey knit, modacrylic cotton polyester blend material offers flame resistant properties required by ANSI 107-2010, as well as certified background and reflective material. Meets ASTM F1506 standards with an ARC rating of 10.0 cal/CM2. Jersey knit modacrylic cotton polyester blend. 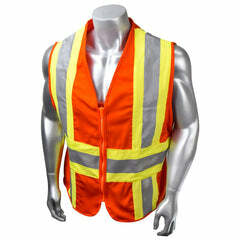 2” 3M® 5535 Scotchlite™ FR segmented reflective tape. 3” contrasting black trim detail. Single horizontal and two vertical reflective stripes. 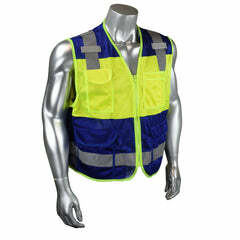 Garment background and reflective material certified to ANSI 107-2010. 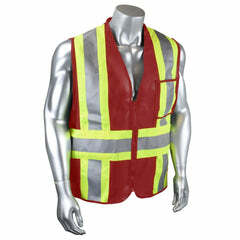 Retro reflective material certified to ANSI 107-2010 Level 2. Sizes: M-5X. Sold per Each.